KwaZulu-Natal (/kwɑːˌzuːluː nəˈtɑːl/, also called KZN or Natal) is a province in South Africa. Before 1994, KwaZulu-Natal was made up of the province of Natal and the KwaZulu homeland. In the 1830s, the northern part of KwaZulu-Natal was part of the Zulu Kingdom. The southern part of KwaZulu-Natal was a Boer republic called Natalia (1839-1843). In 1843, Natalia became a British colony. Zululand emained independent until 1879. Today KwaZulu Natal is the home of the Zulu nation. It is called the "garden province." Two natural areas, the iSimangaliso Wetland Park and the uKhahlamba Drakensberg Park, have been declared UNESCO World Heritage Sites. KwaZulu-Natal is located in the southeast of South Africa. It borders three other provinces, the Indian Ocean, and the countries of Mozambique, Swaziland, and Lesotho. Its capital is Pietermaritzburg and its largest city is Durban. A view of the Mngeni River valley near Howick Falls. KwaZulu-Natal is about 92,100 square kilometres (35,600 sq mi) in area, making it about the same size as Portugal. The province has three different geographic areas. The lowland region lies along the Indian Ocean coast. It is very narrow in the south and widens in the northern part of the province. The central region is called the Natal Midlands. The midlands are hilly plateaus that rise toward the west. The third region is mountainous. The two mountain ranges are the Drakensberg Mountains in the west and the Lebombo Mountains in the north. The Drakensberg mountains are basalt cliffs that rise 3,000 m (9,800 ft) near Lesotho. 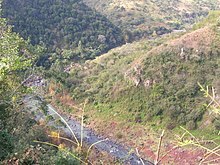 The Lebombo Mountains are ancient granite mountains that run south from Swaziland. The Tugela River flows west to east across the center of the province and is the region's largest river. The coastal areas have dense stands of subtropical trees and shrubs and deep ravines. Afromontane Forest grows on the steep sides of the ravines. The midlands have moist (wet) grasslands and small pockets of Afromontane Forest. The north is mostly wet savanna. The Drakensberg region is alpine grassland. One of the biggest problems in the province is HIV infection. The country of South Africa has more HIV-positive citizens than any other country in the world. KwaZulu-Natal has the highest rate of HIV infection of all of the provinces. According to UNAIDS in 2009, the infection rate is 39%. Many people die from complications from AIDS. Infected people in KwaZulu-Natal do not have the health care, medicine, and proper food they need to stay healthy. HIV/AIDS has slowed economic growth by destroying human capital, the ability of people to make money in society. Comrades Marathon – A yearly marathon run between Pietermaritzburg and Durban. Dusi Canoe Marathon – A yearly canoe marathon, starting in Pietermaritzburg and ending in Durban. Durban July – South Africa's premier annual horse racing event at Greyville Racecourse in Durban. Mr Price Pro – a premier international surfing event at Durban during winter. It used to be known as the Gunston 500. ↑ Mid-year population estimates, 2010 (PDF) (Report). Statistics South Africa. 2010. Retrieved 14 January 2011. ↑ Dugger, Celia W. (30 September 2009). "U.N. Cites Global Rise in Detection and Treatment of AIDS". New York Times. New York. p. A12. Retrieved 14 June 2011. ↑ Dugger, Celia W. (19 July 2009). "South Africa Is Seen to Lag in H.I.V. Fight". New York Times. Retrieved 10 July 2009. ↑ Bell C, Devarajan S, Gersbach H (2003) (PDF). The long-run economic costs of AIDS: theory and an application to South Africa. World Bank Policy Research Working Paper No. 3152. http://www1.worldbank.org/hiv_aids/docs/BeDeGe_BP_total2.pdf. Retrieved 28 April 2008. This page was last changed on 7 August 2018, at 15:32.